Lisa over at Amateur Nester interviewed me for a blog post recently, and it’s posted today! Please stop on over to visit, read, and show Lisa some love – and be sure to follow her blog! 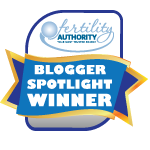 She’s a fantastic advocate for the infertility community, and you might just learn something while reading her beautiful and informational posts!